On Friday, there was a major development in the ongoing Iran nuclear negotiations. It’s being reported that major world powers have begun talks about lifting UN sanctions on Iran if a nuclear agreement is struck with Tehran. Some are suggesting that this step could make it harder for the U.S. Congress to undo whatever deal the Obama administration works out. Now joining us to unpack all of this is Robert Naiman. He is the policy director of Just Foreign Policy, and he joins us from Urbana, Illinois. Thanks for joining us, Robert. ROBERT NAIMAN, POLICY DIRECTOR, JUST FOREIGN POLICY: Thank you. DESVARIEUX: So, Robert, just first off explain to us the significance of these reported talks. And if the UN decides to lift sanctions, could it bypass the U.S. Congress on the issue of lifting sanctions? NAIMAN: Well, the first thing for people to understand is that there’s nothing unusual or bizarre or last-minute about the idea of going to the United Nations Security Council to seal the deal. On the contrary, what’s last-minute is the move by some Republicans to pretend that they’re scandalized or that there’s something unusual about going to the United Nations Security Council when the United Nations Security Council has been a key part of this story all along. These are not bilateral talks between the United States and Iran, although of course there are some bilateral talks. But the overall story for years, going back to the Bush ministration, has been a multilateral negotiation involving Iran on the one hand and six other countries, the so-called P5+1. P5 mean–that’s shorthand for the five permanent members of United Nations Security Council, so, like, the executive committee, if you will, if the United Nations Security Council. So the United Nations Security Council has been a key part of the story all the way along. 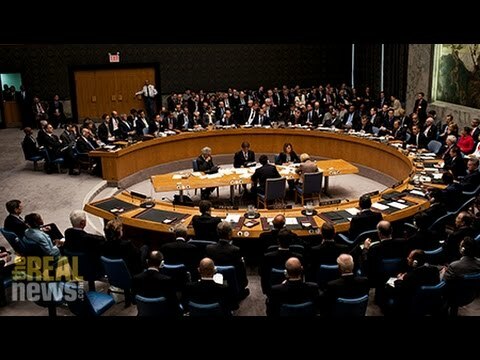 The backdrop of these negotiations always has been the resolutions passed by the United Nations Security Council, pushed by the United States–again, going back to the Bush administration–including the UN Security Council demands that Iran suspend the enrichment of uranium, which was the lever, the stick that was supposed to push Iran towards negotiation. Now, everybody has always understood that in a negotiated deal, Iran would be allowed to enrich uranium as part of a package of things that they would agree to, including increased transparency, increased inspections, limits on their enrichment, limits on their nuclear program. So of course the Iranians have always reasonably expected that in the end game, a deal could be sealed with a United Nations Security Council resolution that would supersede the previous resolutions. So there’s nothing unusual about this at all. And as far as the role of Congress is concerned, the administration has always been clear, going back at least to the confirmation hearings of Secretary of State Kerry as secretary of state, that the administration planned to do this as an executive agreement, as 90 percent of the diplomatic agreements of the United States have been in recent decades in both Democratic and Republican administrations. So, again, for Republicans in Congress to pretend that there’s [incompr.] scandalized by what the administration has said all along was their intention, this is just kind of like trying to work the rafts of the media and public opinion to trick people into thinking that there’s something unusual here when there’s not. DESVARIEUX: Okay. And one of those scandals that came out this week actually involved Secretary Kerry, who you mentioned. And he discussed at a Senate Foreign Relations hearing that essentially that whatever deal is struck, the administration strikes with Iran, that it won’t be legally binding. And Republicans have sort of been running with this idea. First I’d like you to comment on that. And secondly, there is also the argument being proposed by Republicans that essentially sanctions is the role of the legislature, and the legislative branch has the power to enforce the sanctions, and therefore they should also have the power to waive them, and that Congress should be the ones making the decisions about whether or not to waive those sanctions against Iran. What’s your take? NAIMAN: So, first of all, the nonbinding thing, that’s–again, that’s not news. That’s just restating that they’re planning to do this as an executive agreement as they said all the way along. So it’s not legally binding. What makes it binding is the tradition and there’s expectations in international affairs that when two countries make an agreement, they stick to the agreement. That’s usually how it goes. They could in the future–either side could violate the agreement, but that would be very painful to whichever side violated the agreement or broke the agreements [incompr.] ’cause then the whole world would say, oh, it’s that country’s fault. If the U.S. breaks it, oh, it’s the Americans’ fault; if Iran breaks it, oh, it’s the Iranians’ fault. And then people would rally against, countries would rally against the people that broke the agreement. So there is no news here at all. In terms of the role of Congress on sanctions, President Obama isn’t usurping or threatening to usurp anything. He is planning to use the authority that he legally has, that he’s–always legally has, that everybody knows that he has, that everybody knows he’s planning to use. President Obama can, by himself, overturn sanctions that he has imposed by executive order. That is, there is no news there. President Obama can, by himself, use the waiver authority for congressionally passed sanctions that Congress has given him, that Congress gave him openly when it passed those sanctions. Congress passed sanctions giving the president waiver authority. The idea of waiver authority is that it’s giving the president power to change them if he certifies certain things that are specified in the legislation. This is in the interests of–the national security interests of the United States. That was always understood. It’s a standard thing for Congress to do. Members of Congress understood when they passed these sanctions that they’re giving the administration flexibility. Again, the administration was always clear that it was going to use this authority. The role that Congress has by law that the president cannot take away, isn’t threatening to take away, only Congress can fully repeal congressionally passed sanctions. Only Congress can change the law. The president can’t do that. The president isn’t proposing to do that. These negotiations have always been premised, the administration has been very clear that it understood what it can do and what it can’t do. And that’s why–. DESVARIEUX: But Robert, hold on. But I just want to clarify that. What’s the difference between waiving sanctions and then repealing them? NAIMAN: Waiving sanctions means the president uses the authority that Congress has given him to say that right now we are not going to enforce these sanctions. It’s a temporary–depending on the law, it’s a temporary maneuver that the president can renew. The authority of the president to do this was specified by Congress when it passed the sanctions. And not all the laws are exactly the same. But what a number of laws have in common is that they gave the president waiver authority. They gave the president authority to say, okay, the law remains in place, but right now we’re not going to enforce it [incompr.] the president said we shouldn’t. Congress gave him that authority when it passed the sanctions bill. DESVARIEUX: And the president can say how long he can have these sanctions waived? NAIMAN: So each law specifies what the waiver authority of the president is. So sometimes it says the president can waive it for six months at a time, and it says in what circumstances. You know, the president, typical thing–again, they’re do not all the same, but a typical thing to say: if the president certifies that it’s in the national security interests of the United States. This is all specified in law. And the president and the Congress, these Republican members of Congress, are not really accusing him of doing anything outside the law. They know they can’t. They’re trying to spin things, but this is authority that Congress gave the president, any president–the law doesn’t say Obama; it says president–gave any president when he passed the sanctions. Repeal means that Congress actually changes the law, replaces the law, or removes the law. Only Congress can do that. Nobody’s pretending that anyone besides Congress can do that. The administration has always been clear that its plan for an agreement was that in the first stages of an agreement, President Obama would use his authority to remove executively imposed sanctions and to use his authority to waive congressionally passed sanctions. And only later, when the agreement had taken hold, would he go back to Congress and ask Congress to formally repeal the sanctions. DESVARIEUX: Robert, you mentioned the spin, and I’m sure our viewers are probably trying to get their heads around this. Especially if you’re tracking mainstream press, it can be very confusing. The Senate in this coming week is going to have a debate on the floor over this issue of Iran. So, as this story develops, what should people be really focusing on and paying attention to? NAIMAN: Well, one thing to look at is who says what and why. We’ve seen, for example, in the letter of the 47 Republicans that every member of the Senate, every Republican in the Senate whose planning to run for president in 2016 or talked about it, signed this letter. Seven Republicans didn’t sign it, including Corker, the chair of the Senate Foreign Relations Committee. But Rand Paul, who in the past was a skeptic of military confrontation with Iran, he signed the letter. So that tells you that this is kind of a partisan political move that’s about 2016 if the guy that was previously skeptic signs it and the top Republican on foreign policy in the Senate doesn’t sign it. So look at who’s saying what and why they’re saying it. If it’s the Republicans, who all along have been saber-rattling or the Republicans that are planning president and are appealing to the Republican base or appealing to big pocketed donors like Sheldon Adelson, then you have to really discount what these people are saying. Look for what national security Democrats are saying–Senator Feinstein, who was the chair, is now the ranking member on the Senate Intelligence Committee, and who, by the way, you know, lifetime champion of donations from AIPAC, so not exactly a leftist on this issues. I think that is the–you know, filter out the partisan noise. There is going to be a lot of Republican saber-rattling and almost a kind of a conspiracy theory that some of the Republicans are pushing to this idea that now the whole national security establishment of the United States is part of this conspiracy with Iran to throw Israel under the bus. Also, on Tuesday there’s going to be an election in Israel, and if the final polls are correct, dyspnea is going to lose. At least he’s going to lose in the sense that his party’s not going to get the most votes: the Labor Livni coalition is going to get the most votes. So that sort of tells you something, that even Israelis are saying, we’re sick of Netanyahu, we [incompr.] your warmongering by Iran, you know, what about the rent. That seems to be the mood in Israel now. So if Netanyahu is the guy that the Republicans brought to be the captain of the [incompr.] Iran diplomacy team and even Israelis are saying, we’re sick of Netanyahu, we’re sick of his warmongering about Iran, we want to hear about what you’re going to do for the Israeli economy, maybe that’s a sign that people in the United States should take that this is what’s really going on with the Republicans, that they’re selling this scaremongering fear story that has nothing to do with realistic diplomacy that any independent analysts would have said over the last six years could possibly be achieved in multilateral negotiations with Iran. DESVARIEUX: Alright. Robert Naiman, joining us from Urbana, Illinois. NAIMAN: Good to be with you.